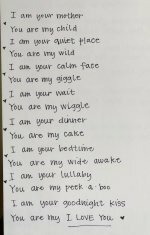 Baby Bootie Cakes with cute pictures and ideas! 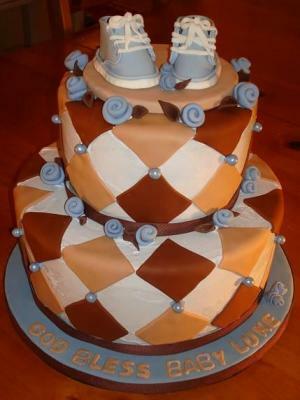 The Ultimate List Of Baby Shoes & Baby Bootie Cakes - Cute Converse Cakes! 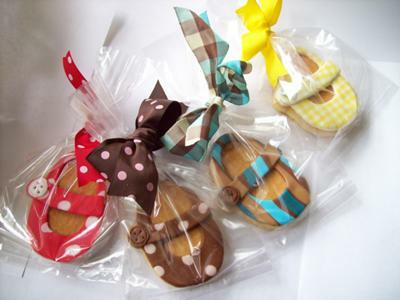 Cute little baby bootie cakes are so precious and not that hard to make! 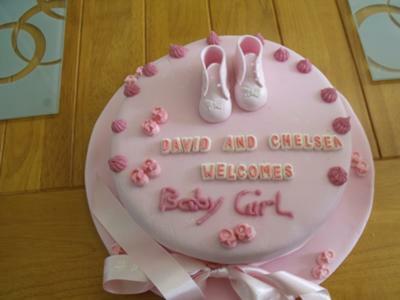 We have gobs of perfect bootie cakes as well as cute baby Converse cakes too! 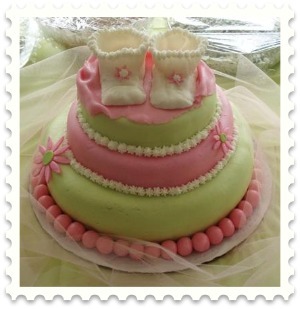 If you are planning a "Baby Bootie Baby Shower" - we've got a slew of adorable cakes for you to see! I made a pound cake from scratch and added Toll-house chocolate to the recipe. The Mother-to-be requested a chocolate cake because the baby was craving "chocolate". Imagine that. I doubled the recipe so that I would have enough cake mix for the three layers. As if the chocolate didn't give it away, we're having a granddaughter!! I made marshmallow fondant (with added colors) and the cake the night before I decorated the cake so that all layers were sufficiently cooled and the fondant had time to cool also. I made the booties the next day using gum paste. The booties were made by hand and not with a mold. The flowers and pearly balls were made with the fondant. To decorate the cake I leveled and de-crumbed the layers and covered all layers individually with butter cream icing. I rolled and placed the fondant on each individual layer and smoothed with my hands, then cut off the excess fondant. I placed small posts in the bottom cake layer before stacking the other layers to prevent sliding. I took the rolled balls and placed on the bottom edge around the bottom layer. I took the butter cream icing and placed stars around both the bottom of the second and third layers. I made a blanket by rolling out the fondant very thin and placing it on the top layer. Placed the booties on top, star decor around the top of the booties, and the flowers to the side of the layers. This cake was was the centerpiece to the food table. I placed a couple yards of tulle around the bottom of it to give it that finished look. This was a fun cake to make and everyone loved it! Especially the mother-to-be. She took the top layer home with her to share with the baby at the 1st year birthday party! 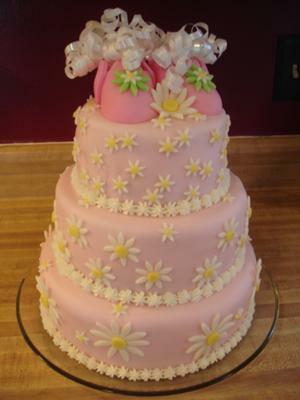 I made this cake for a neighbor's daughter-in-law who was expecting a baby girl. It was a surprise for her. I baked the cake in a 12 inch tin for 50 minutes. The recipe was traditional madera mix with added strawberry mix. Once cooled, I rolled out 4 bars of baby pink icing. I creamed the cake first with butter cream then added the icing molding it into shape. I then iced the board with the same icing. I added a message using iced letters and tube icing. finishing it off with decorations of mini pink booties round the board. and large pink booties on the top. 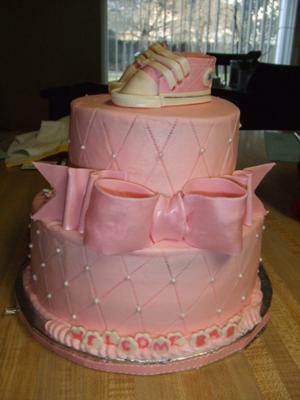 A pretty pink bow finished the cake. Strawberry cake with vanilla butter cream. Used sugar pearls for decorations. Gum paste was used for converse, bow and flowers. All gum paste decorations brushed with luster dust. I used 7 and 10 inch rounds and filled them in with Parisian cream filling and then I iced them in butter cream. I then covered all of it in fondant and in fondant polka dot accents. I made the baby booties out of fondant ahead of time adding jingle bells to shoelaces made of ribbon. Then I made a fondant bear, roses, and a dried fondant Welcome Baby Plaque for a final touch. I made this cake for my niece. Top tier is 2-8" mocha cake with mocha filling. Bottom tier 2-10" white with strawberry filling. The baby shower didn't have an actual theme so my sister-in-law requested a cake that would complement the vases of flowers and girly decorations she would be decorating with. The cake colors went perfect with the pretty pink flowers. It looked very feminine. I made the baby booties, bow, and name, out of gum paste in advance. I originally made the curly cues to enhance the bow, but got the idea of using them as a border as well, and everyone seemed to like it. 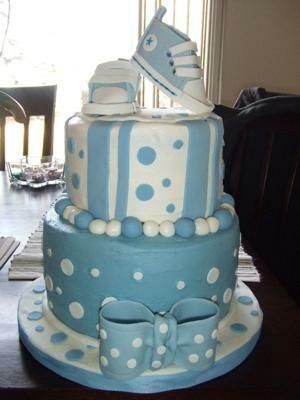 This "Baby Boy Converse Cake" was made using a white cake and was frosted in vanilla butter cream. All of the accents were made using marshmallow fondant. The shoes are made out of a 50/50 fondant gum paste mix. The bow is also made of this. Vanilla cake and covered in vanilla butter cream. Gum paste and fondant accents. Baby shoes are made of gum paste. The three tiers are double layer 10, 8, and 6 inch rounds of my secret recipe white cake. I iced them with butter cream and then covered in light pink marshmallow fondant. Daisies and their centers are fondant cut-outs. The booties are fondant as well, made ahead of time from a template. The ribbons on top are simply gift wrap ribbons tucked inside the booties. 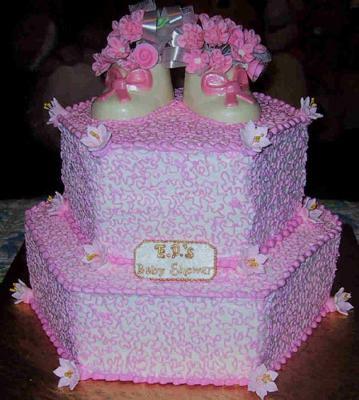 This is a 2-tier pink baby shower cake made with hexagon shaped cake pans. Frost with a pale pink frosting color and then pipe squiggles onto it with a darker pink. I made two, three layer Red Velvet cakes(7inch and 9 inch rounds) with fondant. Decorated them with fondant polka dots, silver dragees and ribbon roses. I made the lavender baby sneakers out of gum paste. I made some cookie favors in the shape of onesies which were covered in fondant also. 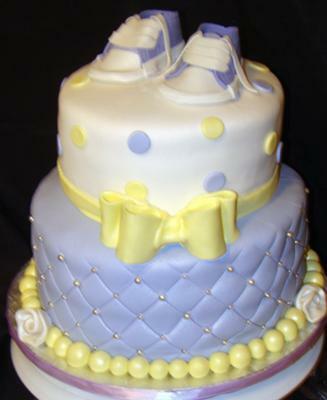 If you don't feel comfortable trying to make the baby shoes for the top of the cake, you could always make sugar cookies that have been cut with baby themed cookie cutters (booties, bottles, onesies, etc), frost them or cover them in fondant, and stand them up on the top of the cake, using a toothpick. 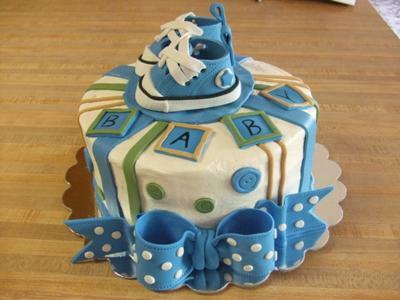 This "IT'S A BOY Baby Shower Bootie Cake" was just a fun and exciting cake for me to make. I made this cake for a woman who already knew that her baby would be a boy. The first thing that I did before even baking the cakes was to make the baby shoes 1 week in advance to give the shoes time to dry. I made the shoes using a free printable shoe template that I just happened to find while searching the internet. I printed out the template and then just cut and traced over rolled out gum paste that I had colored. The shoes and cake color were made to look exactly how they appeared on the invite. They matched perfectly. The laces were made of fondant. All of the accents on the cake were made of marshmallow fondant in which I had found the recipe for by also searching the internet. The blue pearls were made by simply rolling fondant into pearl size balls and then rolling them in pearl luster dust. I "glued" them to the cake using royal icing. The roses,(I found these instructions on-line as well by just searching the internet typing in "fondant roses") brown leaves, and diamond shapes are also made with colored marshmallow fondant. The plaque that the shoes are on is a simple 6-inch cake drum circle that I covered in matching fondant and placed on top of the cake. The shoes are placed onto the plaque accordingly and "glued" down with more royal icing. I used a pretty brown ribbon to match and placed around each tier of cake to give it a nice accent. The cake itself, once frosted was placed on a cake drum that I had previously covered in matching blue fondant and accented with the same matching ribbon. The cake itself in this case, was two tiers, the bottom tier being 10 inches and the top being 8 inches, slightly sculpted with a serrated knife to give it that whimsical look. I baked the cakes from scratch and filled with lemon-raspberry filling. The outside of the cake is iced with a Swiss Meringue butter cream that I tinted a slight light shade of blue color. 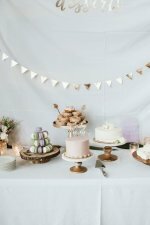 I did use wooden dowels to support the cakes. 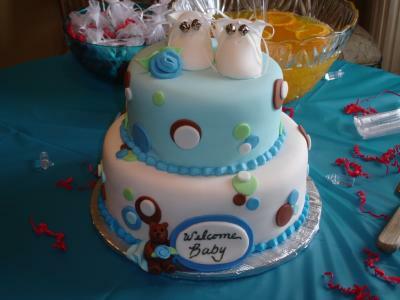 I really enjoyed making and decorating this baby shower cake. All of the cake supplies that I used can all be found at most cake supply stores and if not available, can definitely be purchased on-line. These little cupcakes were made for a baby girls baby shower whose mom LOVES shoes! They are all 100% edible and my original designs. I made a large pan of pound cake, let it cool, then cut out the little shoes using a paring knife and a home made cardboard pattern. Then I tinted marshmallow fondant with food coloring until I got the shades I wanted to create the designs. I used the same cardboard pattern to cut out the top of the shoes then just cut out the spaces with the paring knife and the buckle. The little buttons are also made of fondant. This was so much fun to make! It was time consuming and it is a challenge to cut the fondant just right as it is very fragile when rolled but it was worth it. For the cake you can use the pre-made mix from the supermarket and for the marshmallow fondant you can order some online or in a local cake supply store. I do not recommend Wilton fondant because it does not have a good flavor. You can trace a baby shoe to make a pattern out of cardboard this will serve as a template to cut out the cupcakes from a sheet cake. Once you cut out each cupcake with a paring knife you can then make another pattern for the top of the shoe with the opening so that you can cut out the fondant. Then you can make a pattern for the strap that crosses the shoe as well so they are uniform. The other designs are fairly easy you just tint the fondant the color you want (using powder fondant tint because the liquid one makes it too hard to manage) then layout the fondant in strips or balls and use the rolling pin over them to create the design. 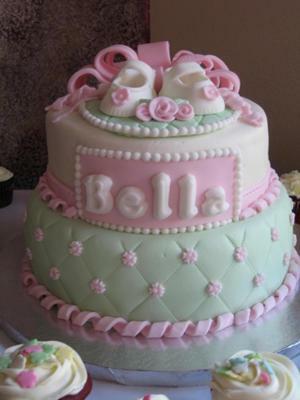 You will need to use butter cream frosting to adhere the fondant to the cake. You can use an actual button to make the mold for the button. Just press the tinted fondant into it and gently pull it out (dust a little powdered sugar or flour with a brush to avoid tearing the fondant). You can use a baking syringe to squirt some icing in the middle of your cupcake for a nice little surprise, just remember you need to cover the hole you create when doing this. Be sure to check out these 2 amazing fondant baby bootie cakes - and watch a DIY video on how to make yummy marshmallow fondant! Spray paint a tree branch to match the shower colors pink, blue, gold, etc.) You can even add glitter if you want. Using cute ribbon, hang baby items from the tree such as baby booties, toys, pacifiers, hair clips, baby hats and anything else you want to hang from the tree. 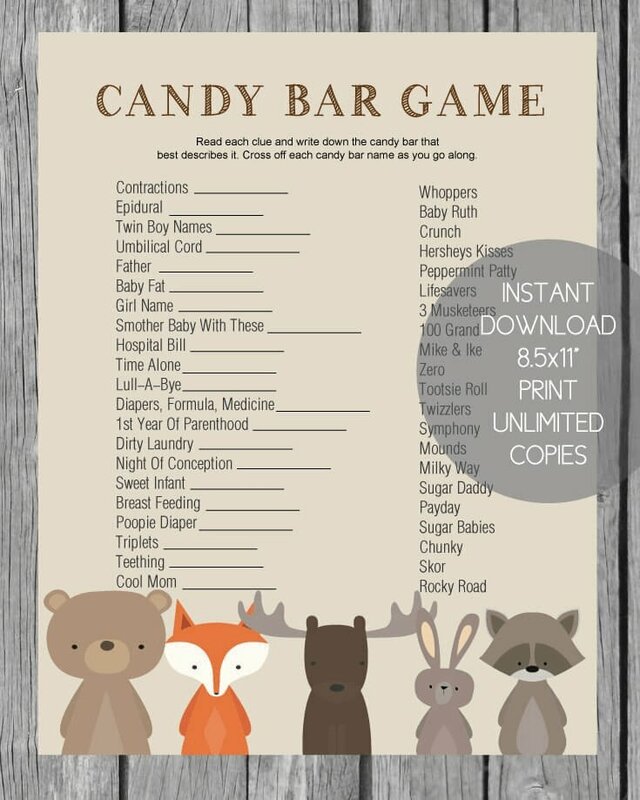 You can also hang a gift card or two and have this be your gift to the expecting mom. 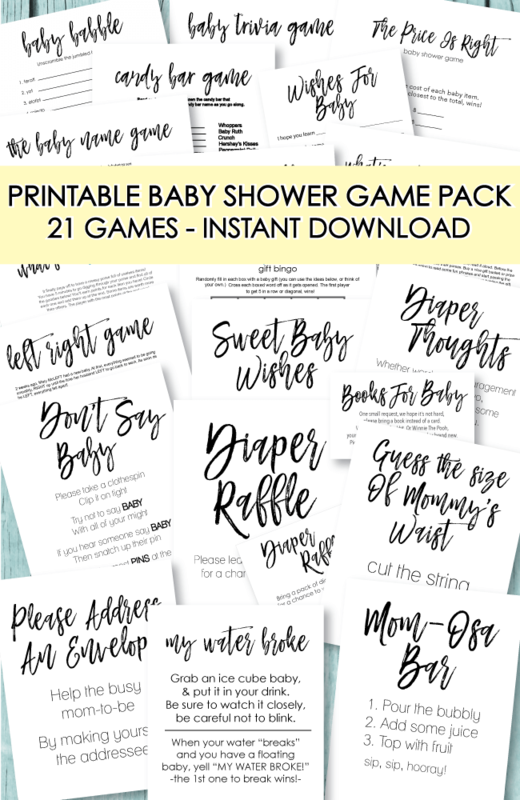 An alternative to this idea is to cut out shapes from card stock such as baby booties, onesies, a rattle (simply Google baby templates for free cut-out templates.) Number each piece that you have cut out and hang from the branches (use cute ribbon or mini clothespins.) When guests arrive, have them take a number from the tree. 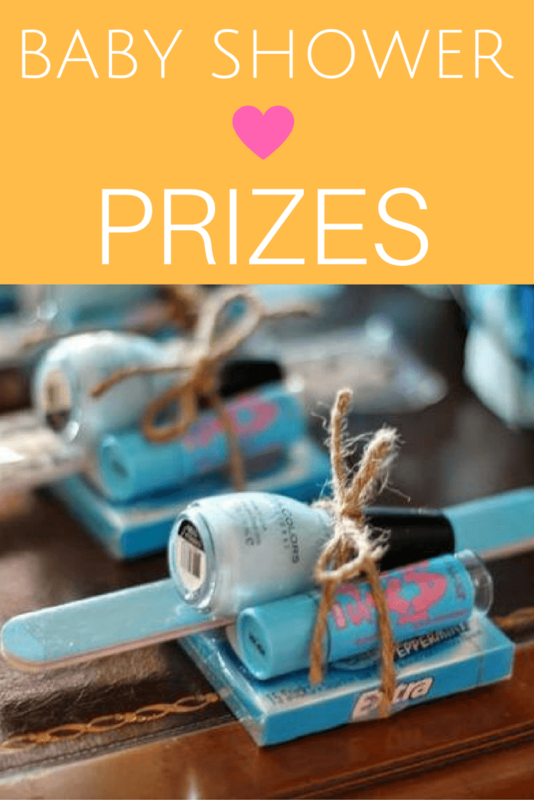 Throughout the baby shower, draw numbers and the guest with that number wins a prize! 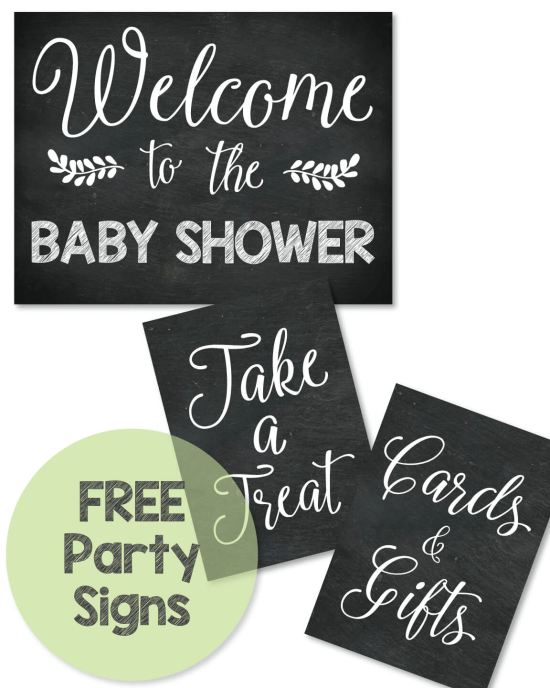 Visit your local craft store and pick out some cute scrapbook paper that matches the baby shower theme and colors. You can also go online to find it. Cut the paper into strips and wrap around water bottle labels. Secure with clear tape. 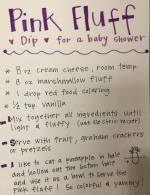 Use a full sheet as placemats or to set food dishes on. Cut into strip and wrap around pillar candles or cylinder vases. 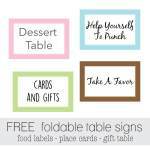 Cut into rectangles and use as gift tags, table tents to label food, guest seating cards, favor tags, etc. 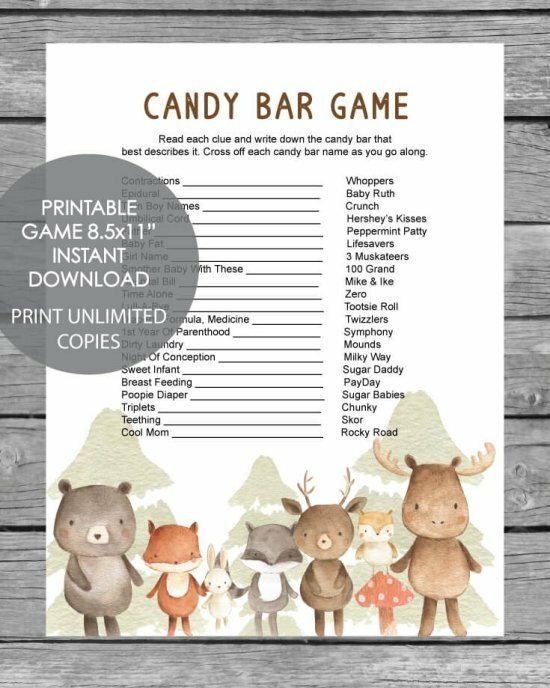 Buy some paper punches that are in baby shapes (at craft stores or online you can find baby bootie punches, baby feet, rattles, etc.) Punch out several pieces and sprinkle on countertops and tables.